A number of years ago I purchased a Yangqin for a relative but never saw it properly tuned. The yangqin is pronounced yawng followed by the word ‘seen’ but started with a t sound. Today I learned a method to tune this instrument and since I couldn’t find any similar info on how it should be tuned I am going to document the process here. My hope is that someone else will have some guidance for tuning their yangqin or will point out any errors in what I ‘m doing. There a number of different layouts for yangqin depending on which part of China the instrument is made and what kind of music will be played on it. I am documenting here the layout for one that was purchased in Suzhou, China near Shanghai in 2004. First a bit about the instrument: The yangqin is a Chinese percussion instrument with many sets of strings that are plucked or hit with small mallets. Individual notes are produced by groups of 1 to 5 strings that follow closely parallel paths on the instrument and are tuned to the same note. The tuning of each note(again made by from 1 to 5 strings) is combination of two mechanical settings. The first setting is the tension set by using a tuning wrench to turn tuning keys on the right side of the instrument. The second setting is the position of a small metal cylinder that simulatneously changes the length of the vibrating section of the string as well as slightly changes the tension on the string. These metal cylinders rest on the wood face of the instrument or for the higher notes, there are pedestals built to support them. The strategy I would follow to tune this instrument is first to set all the metal cylinders to the center of their range of motion. This will allow for simple minor adjustments later due to environmental changes. Then each individual string should be plucked and tuned with the big tuning wrench using a chromatic tuner(just like one would use for a guitar or other instrument). You can probably get a chromatic tuner app for your mobile phone if you have a smart one. There are many strings on this instrument so this process is likely to take hours and I wouldn’t be surprised if each string needs to be tuned a couple of times due to changes overall in the tension on the instrument. Once it is done however, it should be possible to fine-tune it by moving slightly the metal cylinders. 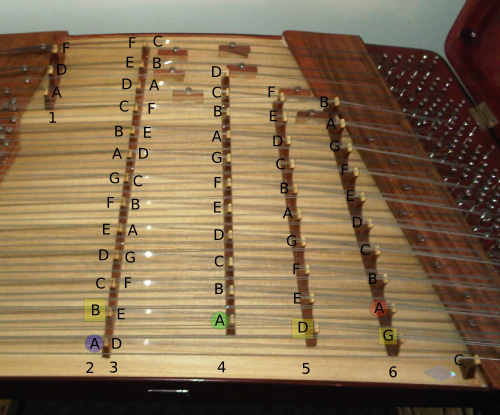 The picture below shows the note that should be produced by hitting each position on the instrument. If a position doesn’t have a note, that means it’s not supposed to be played there. When in doubt if the strings go from a little white bridge to a metal cylinder then you can play it. Now I’d like to explain the relationship between the notes on the instrument. The tuning described here has all notes in the key of C(so no sharps or flats) and the tuning goes from low on the side closest to you to high further away from you. Using the note A as an example the blue A in column 2 (2) is one octave below the green A (4) which is one octave below the red A (6). So by playing the blue, green, and red As in sequence you hear three octaves of A ring together. Note that the only set of bridges for which strings can be struck on either side is the longest column shown as columns 2 and 3. Another octave relationship exists between columns 3 and 5 with the two Ds on the bottom being one octave apart. The yellow D is one octave higher than the uncolored one. The last relationship required to figure this out(and I’m not really sure how column 1 fits into this) is going from right to left with the yellow squares and green A. This is best explained with a note line (like a number line). If I start with the green A in the tuning chart, I should move down melodically four notes in the C-major scale to get the yellow D at the bottom of column 5. Then I should continue 4 notes lower in the C-major scale to get the yellow G at the bottom of column 6. Going the other direction from the green A, notes E and B in columns 3 and 2 respectively are 4 notes each up on the C-major scale. I’m not sure that everyone will spell this instrument the same way in English so here are some other words that might be used to spell it to help those in need find this howto. yong, yang, chin, qin, tsien, chien, yongtsien, yongqin, yongchin, yongchien, yangtsien, yangqin, yangchin, yangchien. Yes, I’m aware a good search engine would do this kind of translation already but I have no idea how that works for Englishified chinese syllables.